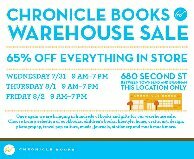 Chronicle Books is having its back to school warehouse sale, where everything in the store will be 65% off. This is a great time to get holiday and teacher gifts! They'll have cookbooks, kids' books, lifestyle and home, art/craft/design, photography, travel, pop culture and music titles. And journals and stationery.